Our Camp Confidence program teaches students to discover and respect the majesty of nature, the humanity of others and the value inside themselves. Building confident youth through nature. $20 provides a camping experience under the stars for up to 12 students. $75 make happy trails for one student who has never ridden a horse before. $500 sponsors one student for their first Summer at camp. I didn't realize how much I was positively affected by my experience with Camp Confidence until I was a grown up. More specifically, not until I was in the position to show off my experiences of overcoming my fears and making awesome memories to the young people I serve. Those who know me well find it unbelievable but my memories (and photos) prove my stories to be true. At the time, I didn't appreciate repelling off of the side of the mountain OR hiking 6 miles in the wilderness after having "bear training" OR whitewater rafting with my glasses strapped around my head for safety! (See, I lost them in the lake the night before, and my counselor wanted to ensure I didn't lose them again!) I cried many tears during that two weeks, but I can say, it exposed this city girl to a life beyond my wildest dreams literally. Seeing moose for the first time, having to use the restroom (ahem...) outside of a restroom. It completely took me outside of my box. It opened my eyes to know there was more to live than just my part of the city. It made me want to explore and get to know how others. And my perspective on how I learned changed. I realized that if I didn't get an understanding in the classroom, I still had a chance, and it was my responsible to get it at home. I can see the definite correlation of how learning begins with self-confidence, and I became much more confident in my abilities during and after that trip. I even caught a fish with a stick and some string!! Can you believe that!!? I overcame so many fears during that camp!! I experienced things I never would have done on my own. I was pushed to succeed. Just enough for me to take ownership and now reap the benefits. 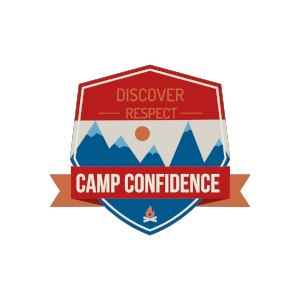 I am a better person because of Camp Confidence. And, I thank them.